But Woodhouse said accepting the position is ‘tentative’. But wait there’s more. All the ‘right’ people gave their support. While the hiring process has been an ordeal, with candidates scared off over concerns about the N.C. GOP’s financial state and adjustments to new chairman Hasan Harnett, the heavy lift is still ahead for Woodhouse. He takes the reins of the state party in a year that will see the re-election campaigns of Gov. Pat McCrory, Sen. Richard Burr, and a Republican majority in the General Assembly. 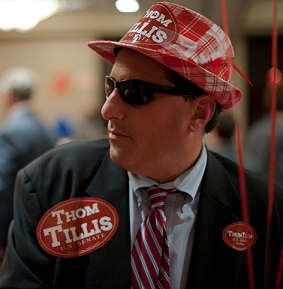 Hey, don’t forget Thom Tillis. He’s important in that line-up. Start the clock. Let’s see how long the new chairman, Hassan Harnett lasts. I can hear the readers asking, ‘What are you talking about, Lady Liberty?’. I’m talking about the word on the street is that the establishment GOP wants to push out Harnett. I’ve been watching. The lack of support by the establishment types in the NC GOP for Harnett is not a secret and I’m here to say I find it disgusting. Newsflash NC GOPe: Your guy lost. The grassroots guy won. GET OVER IT. Seems to me that maybe the primary date changes in HB 373 were aimed not just at controlling national races, but controlling the money for in-state party based agendas. I’ve asked for comment both the NC GOP on Twitter and through back channels on this ‘rumor’. What I got back was silence on Twitter and back channels ignoring the question or they won’t ‘comment on rumors’. If there was nothing to this ‘rumor’, that should have been easy to clear up with a denial. Instead, silence and ‘no comment’. Do the math. This entry was posted in ELECTIONS, GOP, LL1885, NCGA, POLITICS NC, The Articles and tagged Dallas Woodhouse, Hassan Harnett, HB373, NCGOP. Bookmark the permalink. 4 Responses to #NCGOP Elects Woodhouse For Exec Director…Yay? But isn’t the grassroots now demanding the same “submission”? Using this perspective, shouldn’t we have said “Our guy lost” when Boehner was re-elected as Speaker and “gotten over it”? Grassroots are not demanding submission, they’re demanding to just be heard. The establishment is suicidal. When the establishment controls the party, candidate or politician they demand submission. When the party loses control i.e., Hasan, they then actively seek to undermine him. This is rank hypocrisy.